* If your navigation system does not list this address, please type in the old address "Hauptstrasse 2, A- 3400 Maria Gugging" instead. The campus of IST Austria is located in Klosterneuburg, a historical town to the northwest of Vienna. The campus lies only 18 km away from the center of Vienna. Vienna has an excellent public transport system that includes the subway (U-bahn), buses and trams. The ticket machines are available at any subway stop or with the driver on the trams and buses. The ticket needs to be validated (stamped) before entering the subway system or on the bus or tram. The ticket machines do not accept credit cards without the PIN code verification. Cash and debit or credit cards with the PIN code are accepted. 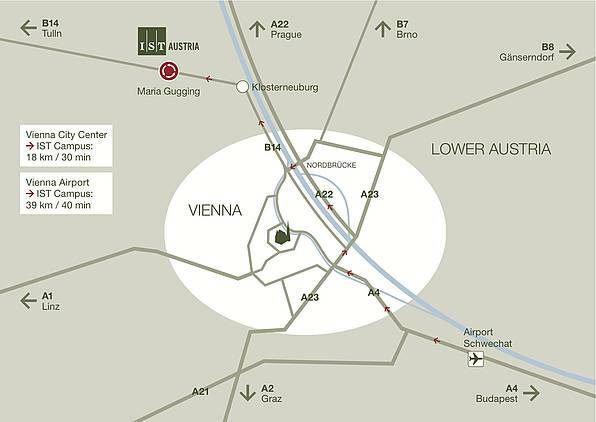 Institute of Science and Technology Austria is located in Maria Gugging, Klosterneuburg, about 40 minutes from Vienna downtown. During the Symposium, a special conference bus will pick up conference participants at Heiligenstadt (U4) bus stop at 8.30 a.m. each morning, stop at Parkhotel Klosterneuburg around 8.45 a.m., and continue on to IST Austria. The conference bus will take participants back to Parkhotel and Heiligenstadt each day after the symposium program, see program for details. After the Wednesday social event participants will also be dropped off at Marienhof. Both the IST Shuttle (Bus 242) and the Bus 239 stop in front of the Institute (stop Maria Gugging - IST Austria) and travel to the subway stop Heiligenstadt on line U4 (see subway map). The trip takes about 25 minutes. IST Shuttle service (free for conference participants) is once an hour on weekdays, and Bus 239 approximately every 30 minutes (2 EUR payable on the bus). 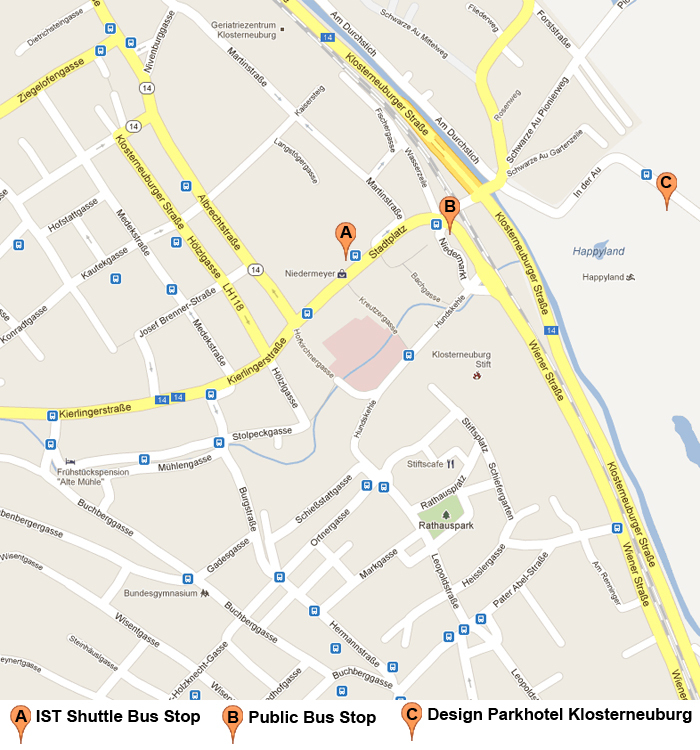 To get to the IST on Sunday take bus 239 from Vienna. 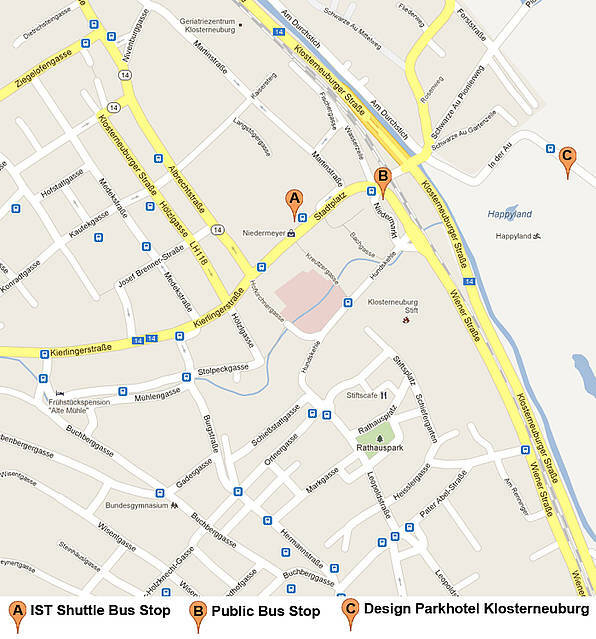 From Klosterneuburg (see detailed map of Klosterneuburg city) you can take Bus 239 or Bus 341. For directions by car, please follow this link. Take the CAT train directly from the VIE airport to Landstrasse-Wien Mitte U4 station (16 minutes with no intermediate stops, 11 EUR one way / 17 EUR return, service every 30 minutes, the well-marked stop is immediately outside the airport arrivals hall, green ticket machines are in the baggage claim and at the CAT train station). Take U4 direction Heiligenstadt to the last stop (Heiligenstadt) after getting a regular on-way ticket for 2 EUR. Take IST Shuttle bus (Bus 242), Bus 239 or the taxi from Heiligenstadt to IST. Both buses start from the same location, immediately outside of the subway station. Tickets for Bus 239 can be bought on the bus. The IST shuttle bus schedule shows connections to the airport; the whole trip from IST to VIE should take about 1 hour. If you take the CAT train for your departure flight, you can check in your luggage directly at the CAT train terminal at Wien Mitte. The public transit system connects to the Federal Railways (local S-bahn and long distance trains) and to the Vienna Airport. The same single-fare ticket is valid for all means of transport in the city zone and permits changes. U4 stop Heiligenstadt is the last stop within the city zone (separate fare is needed for Bus 239). Other kinds of tickets (e.g. day tickets, useful for exploring Vienna) are also available from the ticket machines. U-bahn runs very frequently (3-5 minutes during daytime), from 5am until 20 minutes past midnight, but throughout the night on Fridays and Saturdays and before public holidays. You can take a cab from the airport directly to IST, but be sure to have the full address of the Institute at hand (IST Austria, Am Campus 1, 3400 Maria Gugging-Klosterneuburg). If their GPS does not have this new address yet, try Hauptstrasse 2, 3400 Maria Gugging-Klosterneuburg.